This indeterminate time period's Challenging the Cold Silence promotional release is one I've been looking forward to for a while. 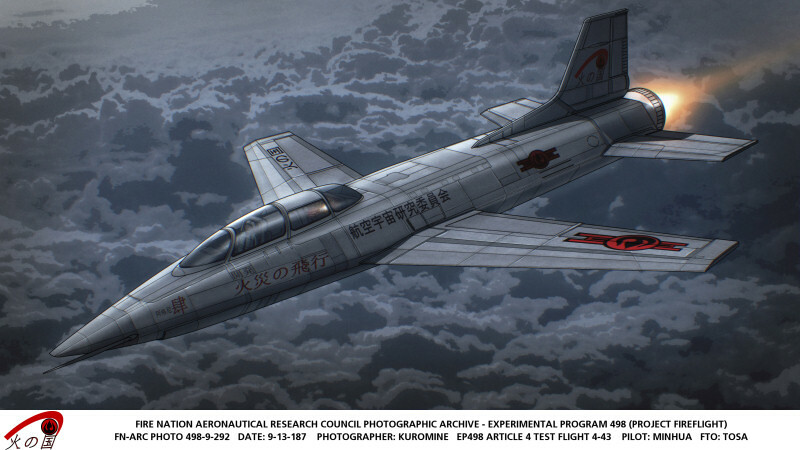 It's an article from The Aeronaut, Dìqiú's rough equivalent to Air & Space/Smithsonian magazine, about an incident that took place shortly after the scene depicted in the second promo (the one from the Republic City Evening Post). This article features a fantastic illustration by Adam Kopala, whom you may remember as the creator of the Phoenix Queen and Vengeance pics you've seen around here. We've commissioned a number of technical illustrations from him for CTCS, and are very pleased to be able to share one of them with you here in order to add flavor to this excerpt and give you a feel for what the rest are going to be like. "You broke the aircraft. This brings back memories." "I still blame Cabbage Corp for that one." This is making me look forward even more to reading the whole thing. I was wondering what FTO meant, until I looked again at the cockpit. Seven different kinds of "whoa, awesome!" right there. "3. This is not a trivial calculation to do in your head when you're falling at terminal velocity." has the ring of one of those breathtakingly understated bits of trivia in the space program that has one looking at the history books and going "how did they manage to keep the death and property destruction so low?!" "You broke the ship. You broke the bloody ship." 2) The photograph of "Professor Koga" on page 26 is actually Chūhachi Ninomiya (1866-1936), an early Japanese aircraft designer and aviation pioneer. Ninomiya's work was contemporary with that of the Wright brothers, but he abandoned his efforts after they beat him to the first flight. The text is Kokugo and says "Hinokoku" ("Fire Nation"). This insignia is displayed on all aircraft owned by the government (including those of the Fire Air Force and Fire Navy Air Force, and civilian and semi-civilian agencies like the ARC and the national airline, Fire Airways). 5) The Agni IV bears no Standard markings because the language was entirely unknown in Dìqiú until 203 ASC. Everything goes better with experimental aircraft! I've been wondering: at this point in the LoK timeline when is the rough equivalent to aerospace technology in our timeline? In "How to Fly to the Moon" it mentions heavy lift technology having been available for a bit which, if heavy lift means the same thing as historically here, would imply at least 30 tons to LEO. Since that would obviate the whole point of the story I'm assuming they have a less extreme meaning of heavy lift. If you had Gemini/Titan IIIC equivalents (1966, 14+ tons to LEO) and was allowed to do in-orbit assembly and lunar rendezvous, I wouldn't need a Saturn V. AFAIKT, no one ever talked about the feasibility of a combined EOR/LOR approach in our timeline either despite the obvious advantages. >rough equivalent to aerospace technology in our timeline? Well, at this point (as in where the canon is now, ca. 171 ASC), it's about 1930. Preparation for the Phoenix Flight begins in 193 and the mission itself is in 200; the parallels are not exact, but it's more or less the late '50s, aeronautically, by that point. There are supersonic military jets, for instance, but they don't work really well yet, and the world's first-generation jet airliners (roughly equivalent to the 707 and DC-8) are only just coming into widespread use. >historically here, would imply at least 30 tons to LEO. In 194 in Dìqiú, "heavy lift" meant a rocket that could get a decent-size satellite into a useful orbit; "heavy" is meant relative to the first generation of launch vehicles, which could barely get out of their own way (as evidenced by the problems the Fire Nation and especially the Earth Kingdom had with their early orbital missions). One could, I suppose, theoretically loft a billion-zillion tiny parts and put them together in orbit, but it would be heinously inefficient and the possibility of things going messily wrong during assembly are pretty high; plus it doesn't fit in with the world's pulp action ethos. Bolting together modules in orbit swashes no bucklers. >ethos. Bolting together modules in orbit swashes no bucklers. Spoken like someone who's never tried docking in Kerbal Space Program. Seriously, it seems like the KSP aesthetic is what you're going for. You should give it a try. >>ethos. Bolting together modules in orbit swashes no bucklers. >Spoken like someone who's never tried docking in Kerbal Space Program. >Seriously, it seems like the KSP aesthetic is what you're going for. >You should give it a try. Well, it's less a question of differing assembly techniques, as the fact that they've really only got ONE GOOD CHANCE to get to the moon in the first place. So the focus is on a single, reliable as humanly possible, moon craft. And since the propulsion system is going to be unique (well, not usable for another hundred years), they're throwing all their efforts into this form of launch instead of the US/USSR's more incremental and assembly approach. It should be noted that both the Fire Nation and Earth Kingdom did very rushed versions of Mercury/Vostok, which were even more on the edge getting them ready than our own world's, so once they got people to orbit, they stopped since they'd pushed the tech curve TOO far for human safety. They decided not to risk things further for the time being; better to just loft better satellites for the time being. I suspect that might have been because rendezvous in orbit was still very much a Black Art in those early days. Just a handful of missions, only one of the astronaut corps at the time (not sure who - was it Grissom? or White?) with an instinctive feel for the technique, no more than basic assembly with the Agena docking missions. I think there was exactly one attempt - it worked, btw - at actual orbital manoeuvering of the docked Gemini/Agena. Anything more sophisticated than that had to wait until Apollo. How long and how many more flights might it have taken before NASA were confident enough to try even an all-up A8 type mission? Remember the deadline they were working with. >very much a Black Art in those early days. Which is one of the reasons they ran Gemini (the rest was EVA experience, mission duration, "precision" landing and pilot control). The chosen approach of LOR also depended on rendezvous, except much farther away from home and support. The only approach that didn't require some sort of rendezvous would have been direct ascent…and that was rejected for a bunch of other reasons. So, no matter what you do, unless you are completely crazy (or using Atomic Rockets), you are stuck with rendezvousing at some point. So, you are going to have to do some kind of flight tests to figure out the issues. >more than basic assembly with the Agena docking missions. Aldrin, in the third astronaut draft, had written "Line-of-sight guidance techniques for manned orbital rendezvous" as his Ph.D thesis in 1963. I don't think anyone at the time had an "intuitive" sense of how orbital mechanics worked (or the history of the Gemini flights would have looked quite different). >than that had to wait until Apollo. Gemini missions with rendezvous or docking of some sort: Gemini 5, Gemini 6A & 7, Gemini 8, Gemini 9A, Gemini 10, Gemini 11, and Gemini 12. They had a lot of problems making the target Agena and its stack work consistently (and Gemini 8 had a vehicle problem), but managed two Agena docking missions (10 & 11) where everything worked and a bunch of partials. They tested automatic system and manual approaches to docking, different kinds of manoeuvering, and proper pilot controls. It was a complete success and proved out most of the manoeuvers and techniques that would be necessary for Apollo. Obviously, the actual lunar landing parts were untestable with Gemini hardware. Sadly, the Apollo contractors didn't pay a lot of attention, NASA ran the projects in a fairly stovepiped fashion. >the deadline they were working with. An Apollo 8 type mission was proposed to be done with the Gemini/Titan IIIC stack (with some risk and a lot of discomfort, the gusmobile was small) for early 1967. The other plans for doing lunar landings with the Gemini derived hardware strike me as pushing too far, but the A8 type mission should have been straightforward, particularly if they did an unmanned one first to prove out the upgraded reentry system that would be needed. Edit: fix some misremembered dates. Why, yes. I am a space nerd. And for the other space nerds here, I recommend Eyes Turned Skyward for your post-Apollo alternate timeline needs. Sorry, Chief. He dissed Gemini, and that's one of my space nerd hot buttons. I am curious to see how Asami handles the same situation, if she has to at all. With enough delta-V you can skip a lot of fiddly issues. He's not alone, unfortunately. NASA took all the wrong management practice lessons out of the 60s effort and that haunts us still. >to at all. With enough delta-V you can skip a lot of fiddly issues. Yes, yes you can. Although you end up with a bunch of other strange challenges to deal with if most of it is only available at one end of the mission. Also, I have no idea why I called you Vort. It wasn't intentional; I was actually trying to follow up on the comment about the combined EOR/LOR option because the choice was pretty much dependent on how well the still-in-the-future Gemini missions went. I might have got my tenses a bit scrambled and given the wrong impression, sorry about that.